by David Friedfertig Marvel’s resident wizard has made his cinematic debut in Doctor Strange, the 14th movie in the Marvel Cinematic Universe. Some of the franchise’s biggest critics would argue that each film in the MCU is not its own complete story and is just teasing future events. So far, it would seem that the movies that do best critically are those that tell a self-contained story. Guardians of the Galaxy was praised for doing this, and while it did tie into the larger universe in some instances, it told its own story without any previously introduced characters holding it back. Doctor Strange is in a similar boat due to its subject matter being further removed from anything else that has happened in a previous Marvel film. While Doctor Strange doesn’t reach the highs that Guardians of the Galaxy did, it is still a solidly made movie that deserves to be called one of the better MCU movies. 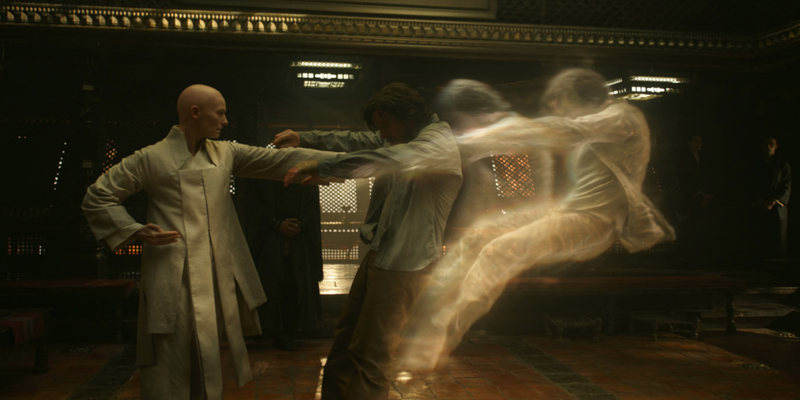 At face value, Doctor Strange is just another origin story that is extremely similar to what audiences have seen before. Stephen Strange (Benedict Cumberbatch) isn’t that different from Tony Stark or Bruce Wayne, as they all share similar character attributes. All three of them were arrogant leaders of their respective fields until a life-changing event occurred and changed their view of the world. However, what makes Doctor Strange stand on its own compared to Iron Man or Batman Begins is the execution of the common superhero tropes audiences have become accustomed to. All of the cast members are great in their respective roles, but some feel somewhat underutilized. While Cumberbatch and Chiwetel Ejiofor (as Strange’s mentor, Mordo) portray their characters adequately enough, other actors are given nothing to do. Rachel McAdams, for example, plays Strange’s love interest, Christine Palmer. The only job she has is to sell the chemistry between her character and Strange. Aside from that, McAdams serves no purpose in the story and certainly doesn’t change over the course of the film. As the villain, Kaecilius, Mads Mikkelsen feels especially misused. As is common in most Marvel movies, the focus is more on the hero, leaving the villains underdeveloped. Kaecillius is no exception. While he has a few fun interactions with Strange, such as their fight in the Sanctum Sanctorum, he mostly just feels like another bland Marvel villain. Kaecillius sees something in the world that few others do and takes matters into his own hands in order to fix the problems he envisions. He is no different than the extremely forgettable Malekith from Thor: The Dark World. Hands down, the best part of Doctor Strange is the visual effects. Everything from the fight sequences to simple dialogue scenes heavily utilize masterful special effects. It’s absolutely dazzling. In one sequence, facades of buildings fold in on themselves, rotating in different directions, and in another, Strange falls through all of the dimensions of the multiverse. This is also one of the few movies that actually works better in 3D. Watching it in that format allows all the dynamic visuals to pop out of the screen more, resulting in a greater feeling of awe. For me, the biggest drawbacks are the tone and pacing of the movie. These problems become apparent halfway through, as action scenes seemingly happen one right after the other without giving the audience many chances to breathe. The beginning also displays this problem in the form of Strange learning his powers too quickly. There should be more of a time gap between when Strange first becomes a student of the mystic arts and when he is fully proficient with magic. Then again, this is only a very minor issue. The overriding tonal problem also appears halfway through. I won’t go into spoilers, but I’ll just say that a certain character’s reactions to the events happening around them were unrealistic and took me out of the movie a little bit. The tonal inconsistencies and pacing problems pale in comparison to all that Doctor Strange does right. Realistically speaking, everyone who loves Marvel movies probably went to see this despite what any movie critic said. Comparatively, for those who don’t like superhero movies, Doctor Strange is not going to change your opinion of the genre. However, if you’re just looking for something fun to watch for two hours, you can certainly do worse than this. Doctor Strange is certainly one of the better movies in Marvel’s canon, and now that the character’s origin story is out of the way, I’m excited for his future adventures in the MCU.